Thousands of far-right activists marched to incumbent President Petro Poroshenko's administration headquarters earlier this month, chanting about alleged corruption and throwing funeral-style bouquets and toy pigs to symbolize the embezzlement of state funds. Ultranationalists have also gone to campaign rallies where they fight with police and heckle Poroshenko, who is running for a second five-year term in the March 31 presidential election. And earlier this month, the ambassadors of the Group of Seven leading industrialized nations sent a letter to the Interior Ministry voicing concern about the ultra-right's assertive posturing ahead of Sunday's presidential vote. The protests reflect the growing presence of far-right groups in Ukraine and their power in shaping the nation's political agenda, leaving the West in a quandary. On the one hand, the ultranationalists have played a key role in fighting Russia-backed separatist rebels in the east and are now challenging government corruption. On the other, they are pushing with increasing boldness for changes that go against traditional democratic ideals. In a series of violent actions that underline their strength, right-wing radicals in recent years have assaulted gatherings by LGBT and women's rights activists, attacked Roma encampments around the country, derailed a lecture on the history of the Holocaust and brawled with pro-Russia veterans. The ultra-right groups also have a strict, military-style structure, and many of their members have battlefield experience from years of fighting in the east. While the far-right groups have so far failed to unite behind a single presidential candidate, they have gained growing clout, with the government reluctant to challenge them. Andriy Biletsky, the leader of the National Corps, one of the most visible ultra-right groups, predicted that the nationalists "will become the backbone of civil defense in Ukraine." 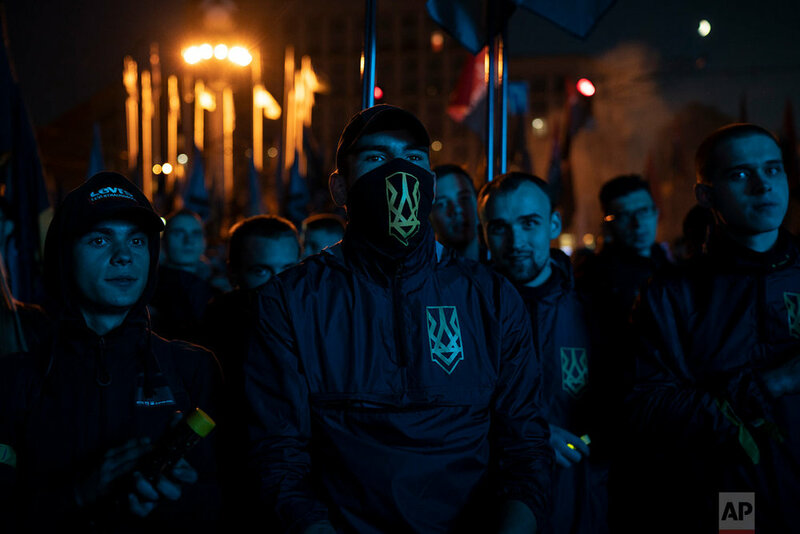 Andriy Yermolayev, the head of the New Ukraine independent thinktank, said the government in the past had turned a blind eye to the rise of nationalist groups, using them as a scare tactic. He added that now the ultra-right has turned on the authorities. "The well-organized and aggressive nationalism in Ukraine is a child of the government," Yermolayev said. "The government has lost control over radical nationalists. Poroshenko has lost that game." The government has also been beset by allegations of corruption, after a journalistic investigation linked Poroshenko's top associate and an arms factory he controls to alleged embezzlement in the defense sector. The president denied any wrongdoing and ordered an official probe into the claims. The country's ultranationalist groups came to the fore in 2014, when they spearheaded massive street protests that led to the ouster of Russia-friendly President Viktor Yanukovych. Russia responded by annexing Ukraine's Crimean Peninsula and backing separatists in the east, moves that drew Western sanctions. 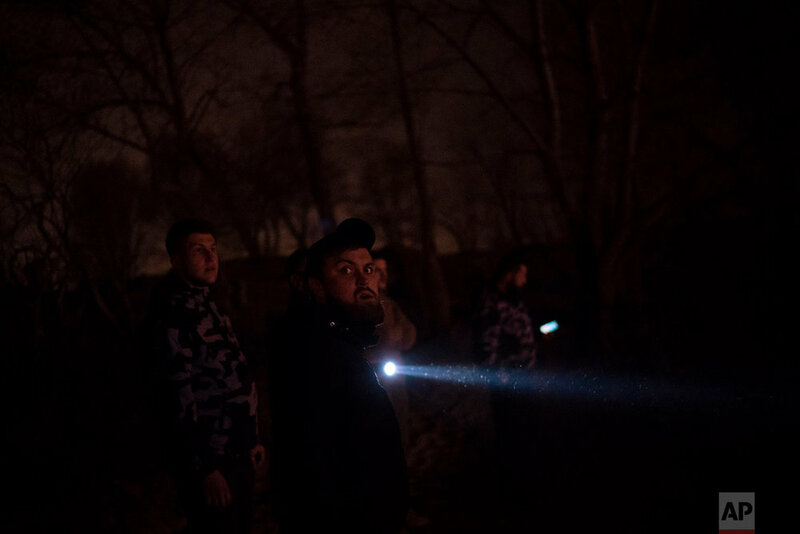 Thousands of Ukrainian nationalists then headed to the east, forming volunteer battalions that served as a vanguard for the Ukrainian forces in the rebel regions. Since then, the influence of nationalist groups has steadily grown, driven by public dismay over the country's economic woes and rampant corruption. Mostly teenage members of the ultra-right groups have followed the guidance of war veterans, practicing martial arts and learning how to handle weapons. The number of ultra-nationalists is estimated at about 10,000, and they can quickly take thousands to the streets and resort to violence. "They have undergone organizational, military and ideological training," Yermolayev said. "They are strongly motivated and active." Torch-bearing ultra-right activists regularly march to the beat of drums across the downtown Ukrainian capital, chanting "Death to Traitors of Ukraine!" During one scuffle at the memorial to a Red Army general killed in WW II, an elderly woman approached a group of radical nationalists shouting "Hang the Russians!" and defied them, saying: "I'm Russian, hang me!" One of the right-wingers, Kiryl Nedin, pushed her back and was briefly detained for resisting police. 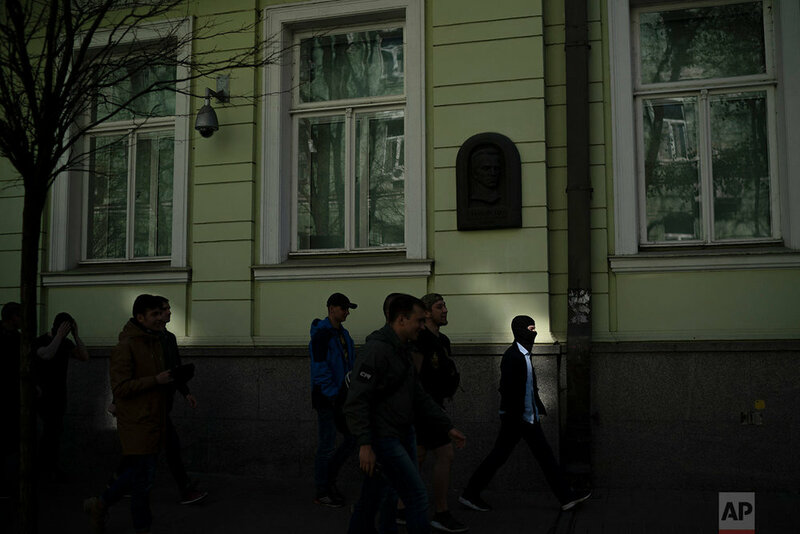 At one demonstration, Yevhen Karas, the leader of C14, a highly visible nationalist group, boasted of the growing power of the ultra-right. "Of all the political parties in Ukraine, I think, no one (except us) can gather so many people, who sincerely and regularly will come to protests and actions," he said. 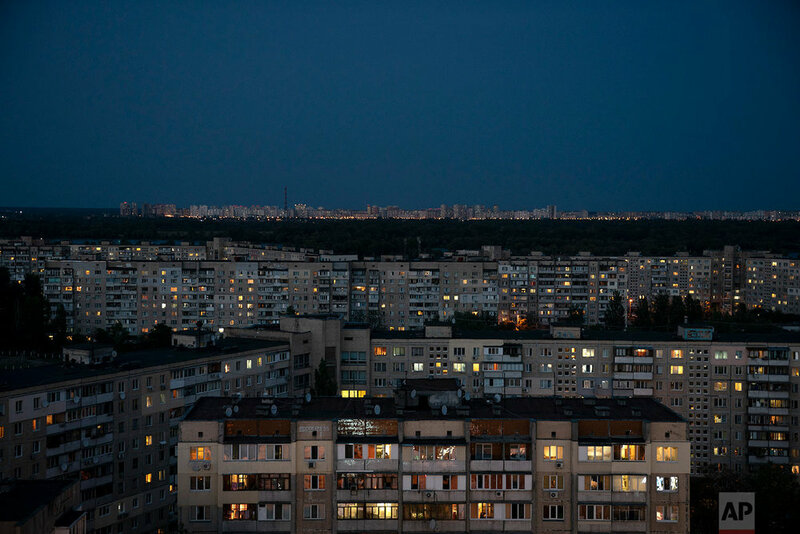 International human rights groups have strongly criticized the Ukrainian government for failing to track down and punish those responsible for the acts of violence and intimidation. The government has promised to rein in the ultranationalists, but has taken no action. Interior Minister Arsen Avakov said the right-wing organizations will be stopped. "They all know it very well," he said. "And... there will be no amnesty for them." The Ukrainian ultra-right argues that the nationalist ideology will eventually prevail not only in Ukraine but across Europe as well. A growing nationalist wave has taken hold in Europe, with populist governments in countries like Hungary and Poland and an increased presence of the far-right Alternative for Germany party in Germany's politics. Miroslav Mares, an expert on right-wing extremist groups at Brno University, said Ukraine's far right has been successful in reaching out to ultranationalist forces in Europe. "They have good relations to some neo-Nazi groupings in Central and Eastern Europe," Mares said. He added that early in the conflict in eastern Ukraine, some members of Europe's neo-Nazi groups trained and fought with the Azov Battalion, a Ukrainian ultra-right paramilitary group created by Biletsky that advocated white supremacist views. The Ukrainian far right also appears to have ties in other countries. Australian Brenton Tarrant, accused of slaughtering 50 people at two mosques in the city of Christchurch in New Zealand, mentioned a visit to Ukraine in his manifesto, and some reports alleged that he had contacts with the ultra-right. The Soufan Center, a research group specializing on security, has recently alleged possible links between Tarrant and the Azov Battalion. Yermolayev, the political analyst, noted that a violent image projected by Ukrainian nationalists could serve as an argument for those in the European Union who are reluctant about putting Ukraine on a membership track any time soon. "How can you integrate a country plagued not only by corruption but also nationalism?" he said. Text from the AP News story, Ukraine's ultra-right increasingly visible as election nears.